Starvine Capital investment commentary for the half year ended December 31, 2018. 2018 in two words: (almost) indiscriminate and anticlimactic. A sell-off is akin to an inverted pinball machine. To put it gently, 2018 ended on an anticlimactic note. Stock markets experienced the steepest drop in December for that month since 1931, capping off the worst year since the Great Recession. For the 2018 calendar year, fully-invested accounts in the Starvine Flagship Strategy decreased 6.6% to 6.8%, while Mid-Large Cap decreased 6.0% to 6.2%. This compares to a decrease in the S&P TSX Total Return Index of 8.9% and an increase in the S&P 500 Total Return Index of 3.6% in Canadian dollars (-4.4% in USD). The strengthening of the U.S. dollar contributed to performance by an estimated 5.2% and 2.9% for the Flagship and Mid-Large Cap strategies respectively. After a relatively good first half in 2018, the overall decline in 2018 was attributable to a sharp market sell-off during the months of October and December. Most impacted were the share prices of small- and mid- cap companies, especially those that do not pay cash dividends. In the second half of 2018, fully invested accounts in the Starvine Flagship Strategy decreased 15.7%, while fully-invested accounts in the Mid-Large Cap Strategy decreased 12.5%-12.7%. During the period, the S&P TSX Total Return Index decreased 10.8% and the S&P 500 Total Return Index decreased 8.6% in Canadian dollars (-13.5% in USD). Early 2019 has gotten off to a strong start. As of this writing, a rebound in the last few weeks have reversed the paper losses in the Starvine accounts experienced during the full year ended 2018. The sell-off created opportunities within the strategies. However, as both strategies were more or less fully invested in the back half of 2018, the opportunities were mostly in the form of rotating or switching between existing positions where it made sense to do so on a relative basis. For example, two positions could have been ‘cheap’ on an absolute basis before the correction, but the steeper drop of one versus the other presented an opportunity to shift over some capital. There were more trades executed in the Mid-Large Cap strategy (added three new names, removed three names) than Flagship (added one new name) during the sell-off - this was due to certain large cap holdings in Mid-Large Cap declining much less than other holdings, thereby creating an opportunity in select cases to rotate into more beaten up names. My observation is that most statistically cheap stocks were indiscriminately sold down with similar force as expensive stocks. This meant that cheapness in itself was not a protector of market value in the near term. With a three to five year timeframe, I strongly believe the springs for these stocks have been coiled further. If one’s time horizon is five-plus years, it should be clear that paying a cheap price today for a quality, growing company should effectively ‘lock in’ a favorable range of investment outcomes. However, within a short period, anything can happen. It is always possible that the price of a new holding drops another 20%-40% after purchase, but whether that happens is ultimately unknowable. What is more knowable is whether the current price presents absolute value versus the company’s cash earnings. Where skill and experience come into play is in correctly assessing where those earnings will go in the years ahead. Transparency is nonexistent in market sell-offs. It is clear that most investors became accustomed to a lack of volatility since 2011 and for many, October and December were the most volatile months ever experienced. When stocks grind lower for weeks on end, it can be unnerving for market participants. The truth is that there is no way to know exactly how much of a 20% drop (the Russell 2000 Index’s move during Q4 2018) is attributable to rational decisions versus forced or panicked selling. Still, the forces at work that cause such a precipitous drop recur from correction to correction. Similar to a pinball that is propelled multiple times upon hitting bumper after bumper, stocks can suddenly behave in the opposite manner once every several years. Negative news triggers selling. For example, headlines related to US protectionism, monetary policy tightening, Brexit, and the partial US government shutdown all contributed to selling pressure in Q4. leading to lowered confidence and investors switching to “risk off” mode. Hedge funds that rely on computer models, otherwise known as “quant funds”, join in the selling. According to a recent Wall Street Journal article from December 2018, quant funds account for approximately 29% of the trading in the market. Lower prices trigger forced selling via margin calls and stop loss orders. Mutual fund redemptions, more selling from quant funds and tax loss selling join the fray. At this point, prices take a steep dive as the confluence of forces temporarily detach market values from fundamentals. The lower prices beget more selling as market participants continue to act on emotion. Where does the selling end? Eventually, the forced selling dissipates and values become compelling enough that investors feel confident enough to step in amongst the uncertainty. Unless the world is ending, every sell-off must dissipate, not too much unlike a virus that must run its course. The above illustration of the chain reaction surrounding market corrections is merely anecdotal, qualitative and based on observation; I cannot prove the exact mechanics of any of it. 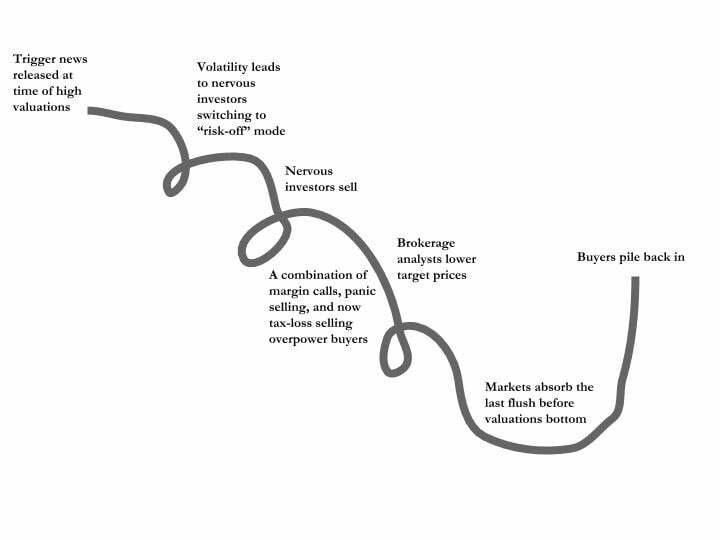 Since such market tumults are chiefly driven by psychology, it is (in my opinion) next to impossible to know with precision when they happen and be able to predict every twist and turn throughout a sell-off. Remember that prices should track ‘fair’ value over time, but in the near term they may become totally disconnected. As per my note from October 2017, prices gravitate back towards value over time, though the timing can never be predicted with any accuracy. 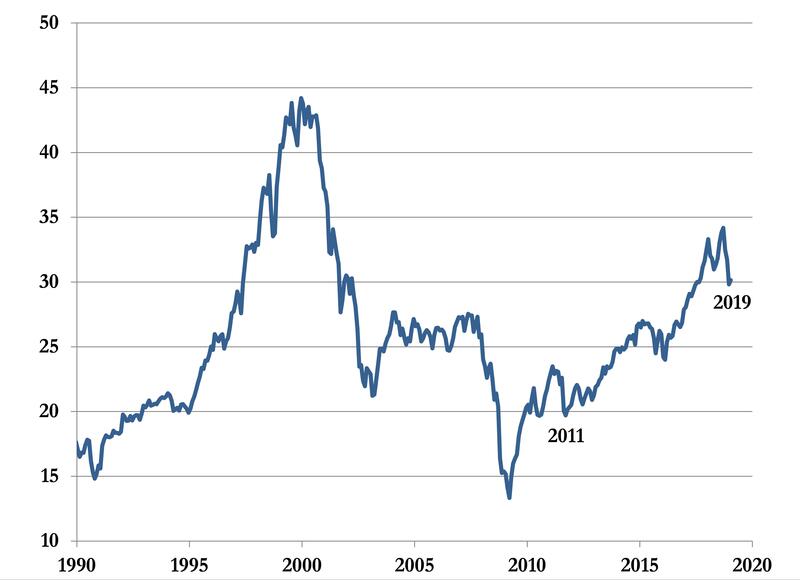 Revisiting the Shiller PE Ratio, which attempts to remove cyclicality in earnings by taking a trailing 10-year average and adjusting past figures for inflation, it can be seen that the latest correction took a “chunk” off the valuation of the S&P 500. If one were to make a retroactive adjustment to historical figures for the Trump tax cuts, which boosted corporate earnings by more than 20%, that would bring down the market PE to a multiple closer to the 25x level. Still borderline frothy, but perhaps the market is not as overvalued as one would perceive on the surface. Einstein allegedly once said, “Everything should be made as simple as possible, but no simpler.” Who knows if he really said that, but it applies directly to long term investing. The bedrock of value investing should be acting on facts or what is knowable versus what is unknowable. Regardless of how accurate star commentators end up on being on their macro calls, it is important to remember that each company has its own bottom-up reality. The Starvine strategies remain committed to being invested in sound risk-return opportunities. Being a long-only manager and fully invested most of the time, it is difficult to time and side-step market tumults. When good businesses are available at prices that are likely to lead to strong absolute returns over a five-plus year time horizon, to me that is much more knowable than predicting the next crash or recession. On the whole, the companies comprising the Starvine strategies continue to deliver strong fundamental performance. Many, in my opinion, were coiled springs that only became more so when their prices declined in October and December off the back of no company-specific news. It was encouraging to see insiders of select holdings purchase meaningful amounts of shares on the open market in the fourth quarter at depressed prices, the most notable being Platform Specialty Products. Insiders in Trisura Group (new holding added in August) increased their exposure through a publicly traded entity called Partners Value Investments, while numerous insiders in Howard Hughes Corporation bought shares before year end. The new year is off to a good start in that both strategies are rebounding after a tough December. A lot of market action is bound to happen between now and the next update in July that will summarize the first half of the year.